April is National Second Chance Month, sponsored by Pr*son Fellowship to celebrate brighter futures for those who have repaid their debt to society. The Georgia Public Policy Foundation was instrumental in bringing together a bipartisan initiative for criminal justice reforms in Georgia. Collins embraced Georgia’s reforms as a launching pad for the FIRST STEP Act — the Formerly Incarcerated Reenter Society Transformed Safely Transitioning Every Person Act — implementing criminal justice reforms at the federal level. 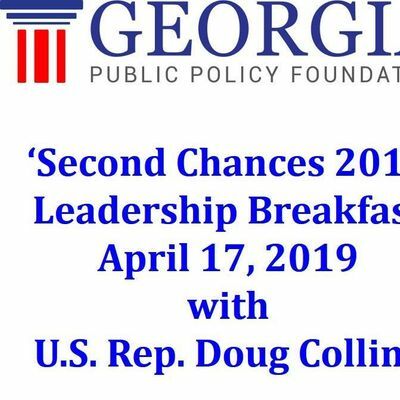 What: “Second Chances 2019,” a Leadership BreakfastWhen: 8 a.m. Wednesday, April 17, 2019 (Registration, networking begin at 7:30 a.m.)Where: Georgian Club, 100 Galleria Parkway, Suite 1700, Atlanta GA 30339Directions: http://bit.ly/Y4YyjcAttire: Business, business casualRefund policy: Refunds provided upon request for registrations canceled before an event’s deadline.